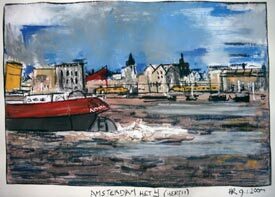 ABOVE: This drawing of an Amsterdam water scene is by the Dutch artist Hans Rijpma. When you're stuck at Schiphol for more than a few hours, take the train into the city. (Our travelogue includes practical tips for the airport and Amsterdam). A short introduction to the city from a foreign visitor's point of view. Photos enhance a page of useful advice for the tourist. This embedded Google Map has options for street, satellite photo, and hybrid views. Click on a quadrant to enlarge a section of this excellent city map. An Amsterdam Metro Map is also available. Click a section of the map for photos and lists of places to see, stay, etc. in the selected district. From The Channels: Amsterdam. The overview map is divided into quadrants that you can zoom in on by clicking. There's also a map of the Amsterdam area. Read these articles on ATM cards, hidden credit-card surcharges, mind-boggling "traveler's check card" fees, the euro, and other financial topics for travelers.